Her powerful vocal performance on “Bill,” impressed movie producers Martin Scorsese and Clint Eastwood so much that they included her in the 2003 documentary “Martin Scorsese Presents The Blues” and the 5-Set CD collection of 120 greatest blues renditions of all times. Peggy had been contently working alongside her husband Robert L. Adams, Sr., as a mortician until she ignited her phenomenal comeback with the Grammy nominated album, “Help Yourself,” which contained the smash hit “Bill.” It was the most controversial, most talked about and most requested song of 1997, prompting interviews with major print media and television shows such as: The Oprah Show, CNN Showbiz Today and Fox Television stations. The “Help Yourself’ CD remained on Billboard’s Blues charts for 67 weeks and peaked #1 for 28 weeks on the blues charts, #9 on the R&B charts and #72 on the Pop charts. Peggy recently made headlines again, The Los Angeles Times, Huffington Post, The New York Times when the story ran on her drive thru viewing funeral home Robert Adams Funeral Home, located in Compton, CA. “The Little Lady with the Big Voice” is back on the tour scene again, bigger and better than ever with her latest single, “Not Good Enough To Marry,” from her current CD, “Life After Bill.” The music industry and her many fans have long awaited for her return and return she has with one of the best projects of her career. 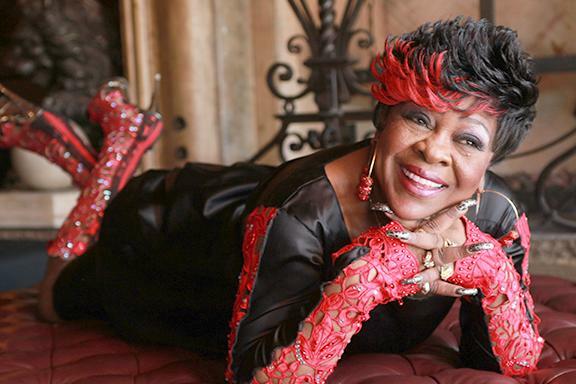 Peggy began her professional career in 1968, by collaborating with Jo Jo Benson to record three consecutive million sellers, “Lover’s Holiday,” “Pickin,” “Wild Mountain Berries,” and “Soulshake.” She later gained success as a solo artist by recording with several major record labels. Peggy has toured the US and Europe, playing such venues as the famed Apollo Theater, Madison Square Garden, The Howard Theater, The Spectrum and the list goes on. In 1990, after a lengthy show biz absence, Peggy was invited to do studio work with the late great Ray Charles. After recording demo material for another female artist, Peggy received another phone call from the” Genius” himself informing her that he could not resist the chemistry that he felt from her strong performance and would like to include the duet, “Back To Love” with her on his “Would You Believe” project. He could not resist calling her a second time to collaborate with him on “If You Give Me Your Heart” on his “Strong Love Affair” project. For the past seven years, Peggy topped the Billboard Blues chart with every one of her subsequent CD’s, namely, “Contagious”, “Undisputed Queen”, “Live in Alabama”, “Hot & Sassy”, and “Busting Loose”. She was sought out by movie producer and director, Keith Beauchamp to sing all of the songs on the upcoming release of the Emmett Till documentary. Her live performances are second to none! In 2007 Peggy Scott- Adams was appointed as the National Ambassador of Music for the World Conference of Mayors. That same year she partnered with famous shoe designer, Eric Baggio and now features her personal collection of shoes BAGGIO for Peggy© located in the Fox Hills and Del Amo Malls in Los Angeles CA. Each song on this album is rich with great lyrics and tight production, which makes it easy for Peggy Scott-Adams to do what she does best…SING! With a vocal prowess that exceeds her petite frame, Peggy, who sounds like a cross between Tina Turner and Shirley Caesar leaves her audiences mesmerized at the strength and conviction in which she delivers each song.